This is the most advanced of GATE Electronics MOSFET range with as much as 10 functions! It features a 3 round burst mode and allows for a rate of fire adjustment without the loss of energy. It has a built in Active Breaking and protects your LiPo batteries. It protects trigger contacts and prolongs the lifespan of your entire gearbox. The Smart Trigger system offers a lightning fast trigger respons. It features two operating modes and can work with either standard or modified AEG wiring. It has been designed with the strongest replicas in mind but will immensely benefit all AEG's. Better trigger reaction, higher rate of fire & power upgrades to your AEG are all excellent reasons to install a MOSFET. It transfers the high current power from the battery directly to the motor bypassing the mechanical trigger contacts. As a result not only are you acheiving all of the above but also you are protecting your trigger contacts from burning out and having to be replaced. Would you like to increase the realism and the lifespan of your gearbox? Does your rifle has such a high rate of fire that it's double firing on single? Active breaking will sort all of that out for you! In SEMI the active breaking will stop the piston in the forward position thus increasing the lifespan of your main spring which is especially important with stronger AEG's. Once the trigger is released the active breaking will stop the gun immediately thus increasing realism and preserving your ammo which will come in handy especially when used with low to mid capacity magazines. This MOSFET will not let you down on the battlefield. It is fully protected against overheating and short-circuits of the eletrical system. It will protect your motor and battery as well. Modern LiPo batteries are sensitive to over discharging which may cause permanent damage to your battery. Microprocessor constantly monitors the battery voltage and will cut off if it drops too low. It is fully compatible with micro switches. It enchances the rate of fire and trigger response and operates much cooler. The use of modern transistors and microcontrollers offers the smallest and most reliable MOSFET's on the market. Rate of fire control enable an efficient adjustment without the loss of energy. Adjustabel between 30% - 100%. For the best trigger response possible! It works with conjunction with the ROF Control system. The first shot is made with a 100% ROF while the susbequent shots can be delayed to a pre-set value (for example 30%). This gives you an almost immediate first shot while the subsequent ones are fired at a rate safe for your AEG. It works best with an 11.1V LiPo giving you a lightining fast first shot and the subsequent rate of fire can be adjusted to be of a safe level as if the gun was used with a 7.4V LiPo. Please note: this product requires fitting - any damage caused during installation will not be covered by the warranty. 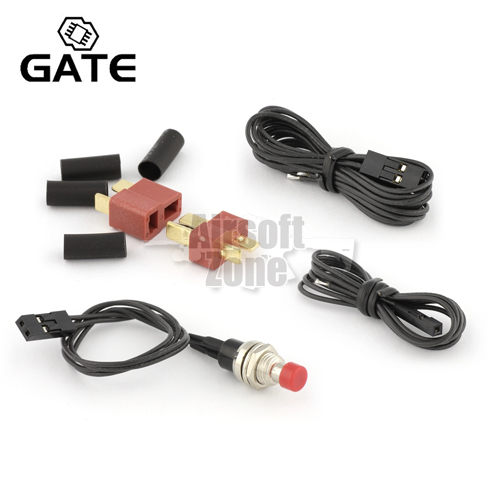 Airsoft Zone is an official distriubtor of GATE products in UK and is delighted to offer a promotional fitting service on any GATE Mosfet purchased from us with an engineering fee of only £15. For full details please follow this link. Every product at GATE goes through an advanced technological process. Prototypes are designed using modern software and sophisticated hardware. 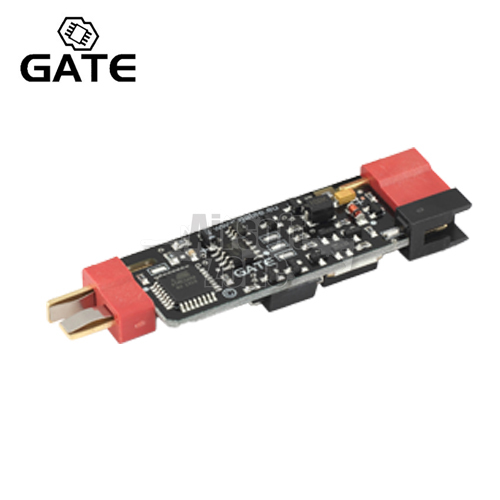 GATE's main goals are reliability and miniaturization. Prior to its introduction to the market each product is tested by a team of 50 independent beta-testers. Thanks to GATE's long-term research, meticulous testing and extensive experience - GATE products are reliable and can operate under the most challenging conditions. All products comply with ROHS 2 and meet CE standards. Electronic circuits are made using modern technologies, SMD 0603 components and 9 mils wires as standard. High-density multi-layer PCB's allow for the miniaturization that GATE offers. In high power circuits GATE uses most powerful transistors available on the market - 'HEXFET Power MOSFETs International RectifierÕ. Thanks to the use of high quality components GATE products are reliable and able to work in harsh conditions.